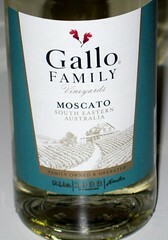 Next sampling from the Gallo Winery is a Moscato. White Wine Wino went all in with this one and gave it a "Good Rating"! Red Wine Wino agreed but had trouble tasting any difference between Gallo's Moscato and other Wineries' Moscatos. Regardless, still meets the criterion for a "Good Rating" - specifically, we would buy it again! One observation to note is that the label indicates a Gallo Winery in South Eastern Australia.